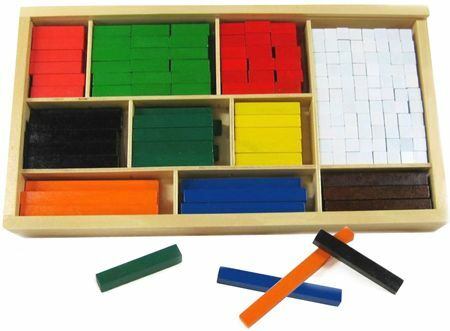 Wooden Cuisenaire Rods are a wonderful three hundred and eight piece set presented in a wooden box with compartments and a perspex lid. Cuisenaire Rods are a great educational aid which can be used to teach addition, subtraction and multiplication. The rods help to give you child a physical size to their maths problems and help them to visualize the results. Not only are they a superb educational aid they are also really fun to play with and wonderful for creating buildings and complex coloured patterns. Just fitting all the pieces in the compartments is a game and challenge in itself. As with all great toys this one blurs the line between play and learning. We really can't recommend it highly enough! Set Contains: Orange 6, White 176, Brown 6, Blue 6, Black 10, Green 10, Small Green 36, Yellow 10, Red 12, Small Red 36. We like this because: "It brings back fond memories of being at school and being allowed to play with the Cusenaire Rods if you finished all your work early."